Everything The O.C. : Just for Fun: Sandy Cohen for President 2016! 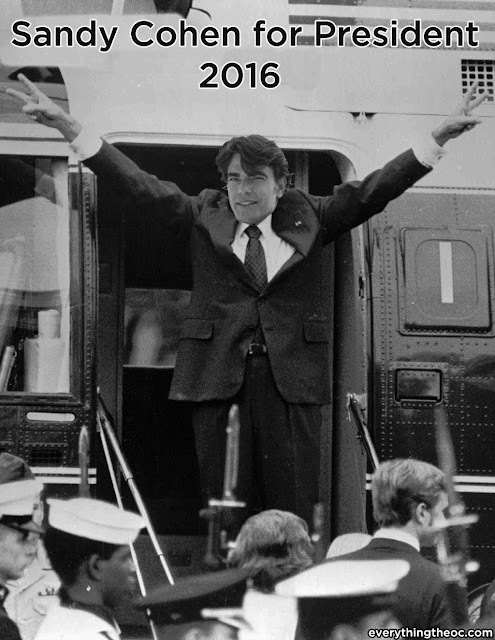 With all the back and forth cat and mouse games and hub-bub involved in the coming election, it is important to realize that Sandy Cohen would be a greater as president in every way! "I like to anticipate the worst at all times. It's a Cohen family trait." "Well. I should be off. Gotta find the next kid to jeopardize the community. Maybe a black kid. Or an Asian kid." Sandy: Hey, listen, you were lucky to be able to hang in there after all that foreplay. Sandy: Hey. If I teach you guys anything, don’t ever get married. Ryan: I’ve heard that from you before. Sandy: Oh you’ll hear it from me again. I’ll be at the bar. "Valentine’s Day is not a holiday. Rosh Hashanah, that’s a holiday. Memorial Day, yes—a holiday. "The next time you feel like using your fists, you better open your mouth and talk. That's what I'm here for." Seth: You get your picture taken? Sandy: Check out my new mug shot. Seth: God, dad those eyebrows are out of control. Sandy: It's a sign of power you know. Seth: Well, then you must be the most powerful man in the world. Sandy: Well, brace yourself son, it's genetic. Sandy: And you're going to yogalates. Kirsten: You just like saying that. Sandy: Yogalates? Yeah, I kinda do. Yogalates? 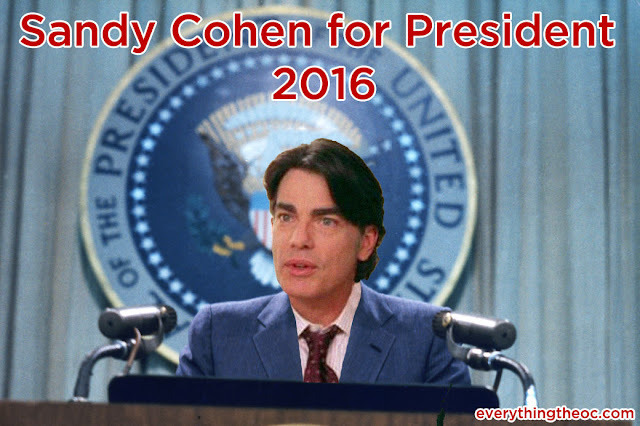 So with that being said get out there and vote Sandy Cohen for President 2016!! "Hi I'm Sandy Cohen and I endorse this message!"